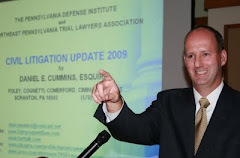 I presented a one hour 2009 Civil Litigation Update at the November 5, 2009 Luzerne County Bench Bar Conference. 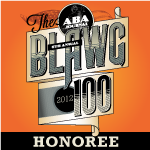 This was the same presentation I gave at last month's Lackawanna County Bench Bar Conference. The Luzerne County Bench Bar Conference was well attended and there seemed to be an atmosphere that the court was continuing to take slow but sure steps forward towards a return to normalcy and away from bad news of the past year. Anyone who may wish to secure a copy of my 2009 Civil Litigation Update materials, may click on the title "2009 Civil Litigation Update" in the JDSupra box in the right hand column of this blog (down a little bit). In the alternative, you can click on this link: http://www.jdsupra.com/post/documentViewer.aspx?fid=91d6c7bb-2b76-46c6-8166-d3a3bf91b740. Please feel free to print out the update for your own use. The update is about 140 pages long and covers important cases and trends in auto law, premises liability, expert issues, evidentiary issues, etc. Also included in the materials are some articles of mine that have appeared in the Pennsylvania Law Weekly, on such issues as the of the status of the assumption of risk doctrine and the seat belt defense in Pennsylvania. There are even articles in the materials that provide a concise summary of the important cases from 2008. So, essentially, a review of this update should leave you well-versed on many of the important cases and issues in Pennsylvania civil litigation arising over the past two years. I invite anyone having any questions or comments on any of the issues in the Civil Litigation Update to contact me to discuss--I would appreciate learning of any more recent developments and/or helping you out further if I can. As for any Pennsylvania insurance company representatives viewing this blog, please note that I am willing to present the hour long powerpoint Civil Litigation Update in your office free of charge (excepting any necessary and reasonable travel expenses of course). Please contact me at dancummins@comcast.net for any requests in this regard. Thank you.